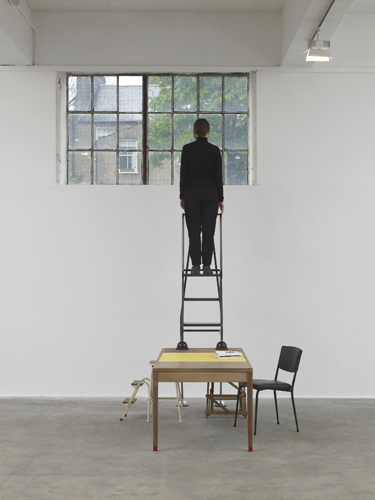 Céline Condorelli, The Double And The Half (to Avery Gordon), 2014, Royal Mail ER office desks, folding steps kitchen stool, security ladder, Heatherley stepladder, yellow polypropylene laminate birch plywood, rubber, dimensions variable. In her recent show at the Chisenhale Gallery—part of an institutional collaboration with the Showroom and Studio Voltaire—Céline Condorelli deploys the joys, hazards and volatility of friendship as a sculptural proposition. For her exhibition, sculpture is framed as an intimate encounter, and intimacy is in turn figured as a tête-à-tête, a to-and-fro give-and-take. At the exhibition’s entrance, a luminous space blanket is draped from ceiling to floor. Condorelli’s snaking curtain, The Bottom Line (to Kathrin Böhm), 2014, rides the breeze of an industrial extraction fan. The curtain’s delicate movements are intensified or diminished by the currents and crosscurrents pumped in from the street. There is a deep affinity between Condorelli’s practice and the work of Felix Gonzalez-Torres. For both, intimacy oscillates between the dialectical poles of presence and absence. In Condorelli’s work, the sculptural object stands in for subject-to-subject relations while simultaneously asserting affective resistance: For example, the centerpiece of the exhibition stacks potted philodendrons on a steel hexagonal structure. Heartleaf philodendrons (“tree lovers”) are known for their leathery leaves but also their capacity to climb, overgrow, and smother their support. On the north end of the wall, Condorelli has cut away at the drywall to expose a hidden window. Just below it, The Double and the Half (to Avery Gordon), 2014, fastens a wobbly set of stepladders to a Royal Mail office desk, inviting spectators to climb the structure and catch a view of the Hertford Union Canal. The artist thus draws attention to the spatial environment and its changing conditions; at night, when the sun has set and the gallery doors have closed, the space is enlivened by an otherworldly fluorescence. For Condorelli, sculpture is a variable experience—it only takes a slight reconfiguration of space to displace your encounter.